Hey Guys! 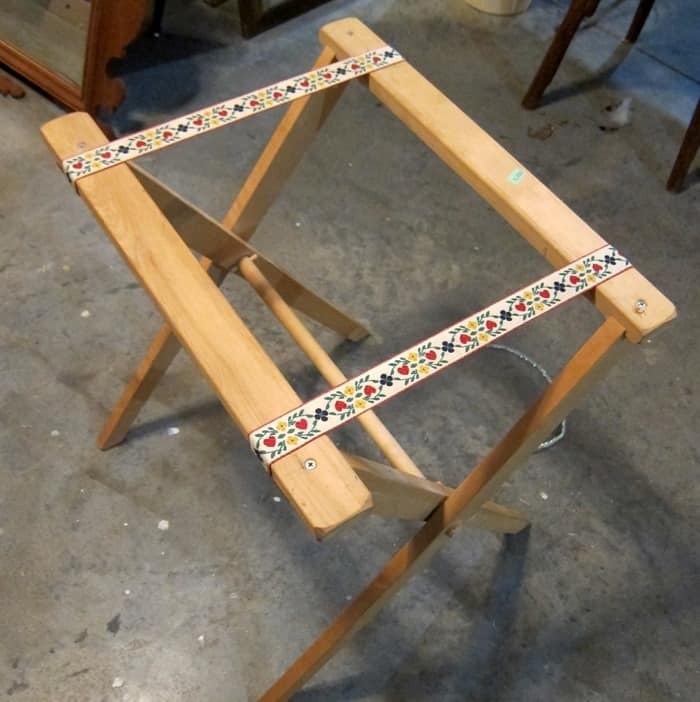 When I saw the folding tray table stand at Goodwill last week I knew just what I would do with it. It needed a topper to turn it into a table. I wasn’t sure if I had anything to make a table top with but I’m always on the hunt so it would just be a matter of time. Imagine my surprise when I already had the perfect topper in the workshop. I really love the finished table. It has a fresh clean vibe and it was super easy to make. 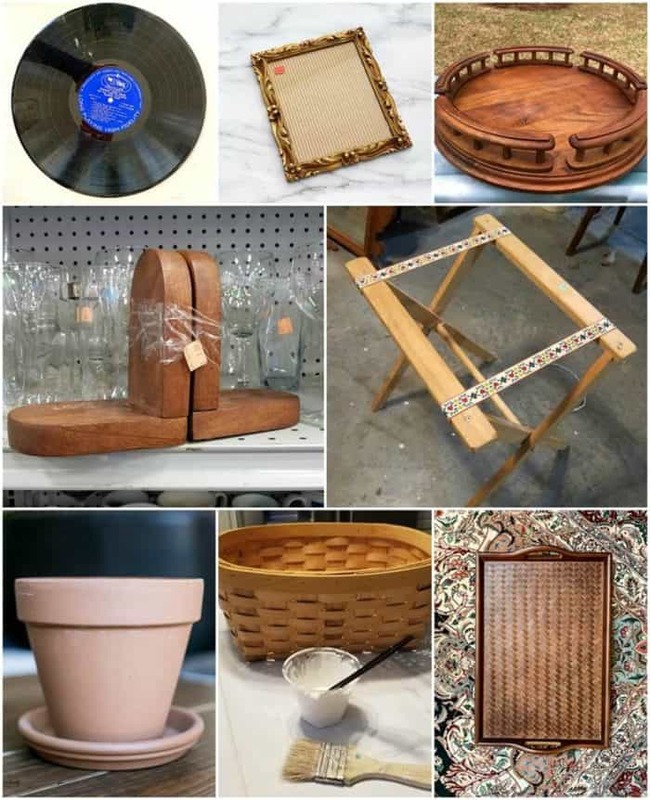 Today is the day of the month everyone looks forward to……..Thrift Store Decor day. 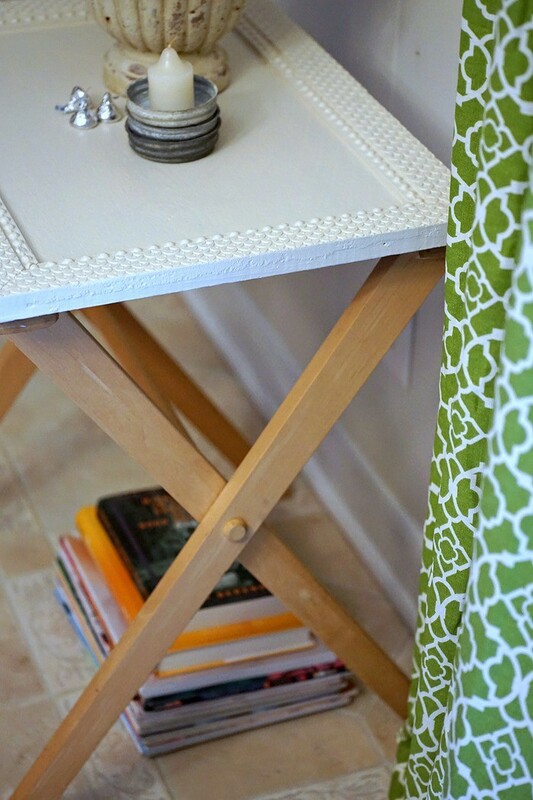 My thrifty friends have some really fun projects to share and the tour links are at the end of the table tutorial. The folding tray table stand was $5.99. Not a steal but an okay deal. I liked the natural wood finish and planned to stick with that. No painting. 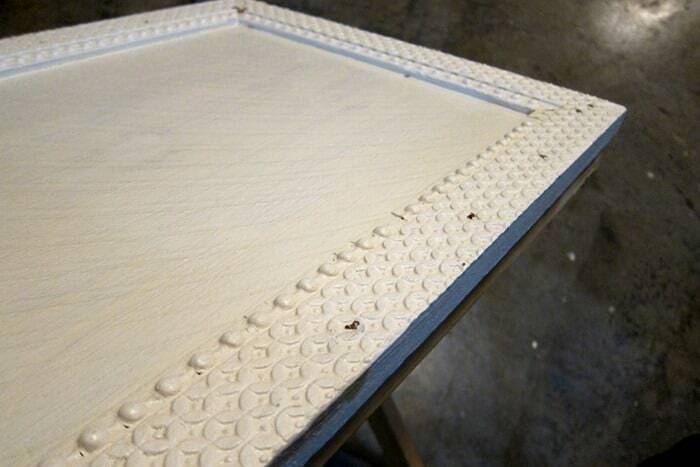 Remember this antique frame with a wood back from my favorite junk shop? I don’t remember how much I paid for it but probably not over $5, more like $2 or $3. Notice how perfectly it sits on the stand frame. Just the right size. I didn’t think finding a table topper would be this easy. I must be living right. No cutting anything down or adding anything in. How pretty is that table. I can’t tell you how much I love the trendy natural wood and white look. I painted the antique frame before attaching it to the stand. All those details are so pretty. I originally really wanted to distress the piece but I changed my mind. It looked so good painted. The paint is Beyond Paint in Off-White. White is really stark and I seldom use it. The off-white has a softer look but still looks white. I left the straps on the frame so that it retained the proper balance until I attached the top. I used my handy dandy Ryobi brad nailer to nail the antique frame to the stand. I turned the table upside down and cut the straps after only putting one nail in each of the four sides. I was able to pull the straps off but it was a tight squeeze between the top and the stand. Then I finished nailing the top to the bottom. I knew I would need to touch up the top where the nails went in but that was easier than painting the top after it was attached to the stand. 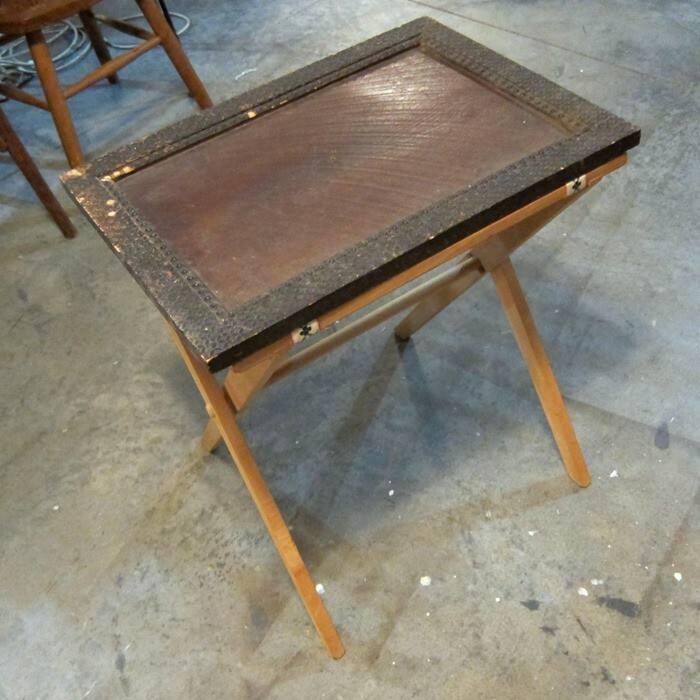 The table is lightweight and can be moved easily. Perfect for serving drinks and snacks to visitors. 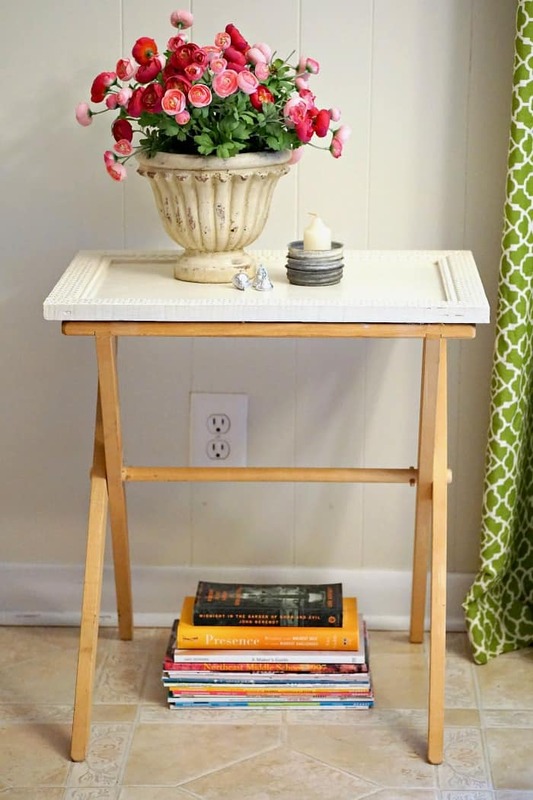 I can also see it as an end table in a sunroom. I forgot to mention that I cleaned up the legs of the stand and waxed them with a clear wax. I like using candy as props. Makes putting the props away much more enjoyable. So how do you like the table? What about the top? Where would you use a similar table? You can make a similar project. You don’t need any special tools. 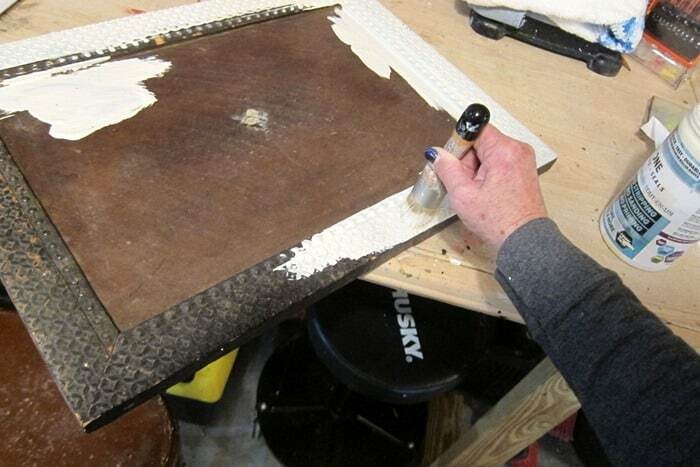 A hammer and nails work as well as an electric nailer, just a bit slower and more elbow grease. Time to see what we have on the tour today. Just click the links below the “before makeover” photo collage. This is very creative and turned out beautifully!! Love it! Kathy, this is a great project. 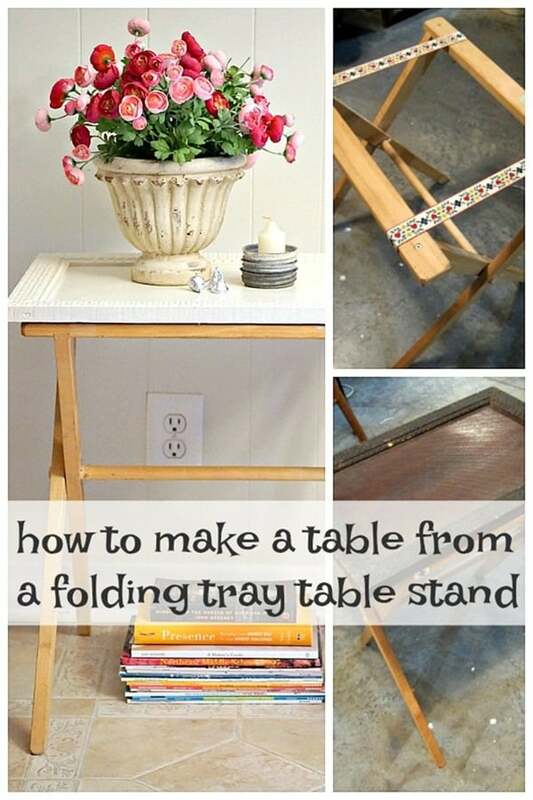 I never thought of making a luggage rack into a table. It turned out really cute, & I agree with Pam that those flowers in that urn are absolutely gorgeous! The perfect combo!! 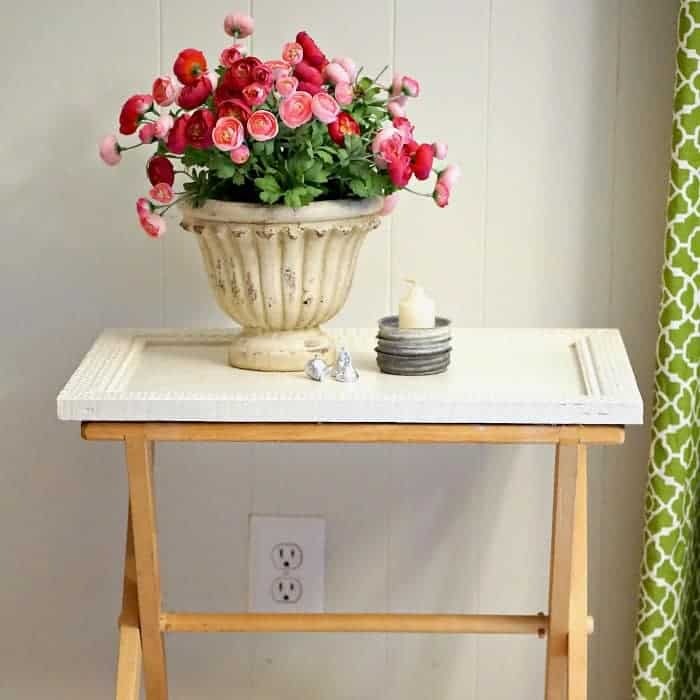 That is the cutest little table now! Are those real flowers, because if not I need me to find some of those? They just shout SPRING to me! 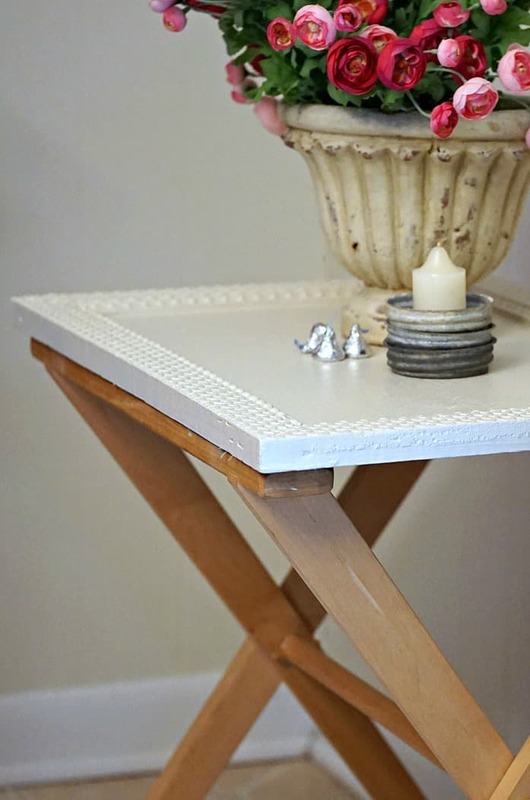 Anyhow, back to the table – super cute! I got those flowers at Goodwill…..where else, lol. Had them for a while and I love them. Inspired, Kathy! I also love those little zinc Mason jar lids used as a candle holder. That’s inspired, too! I can’t believe how perfect that frame fit on top! SO CUTE! That looks fab! 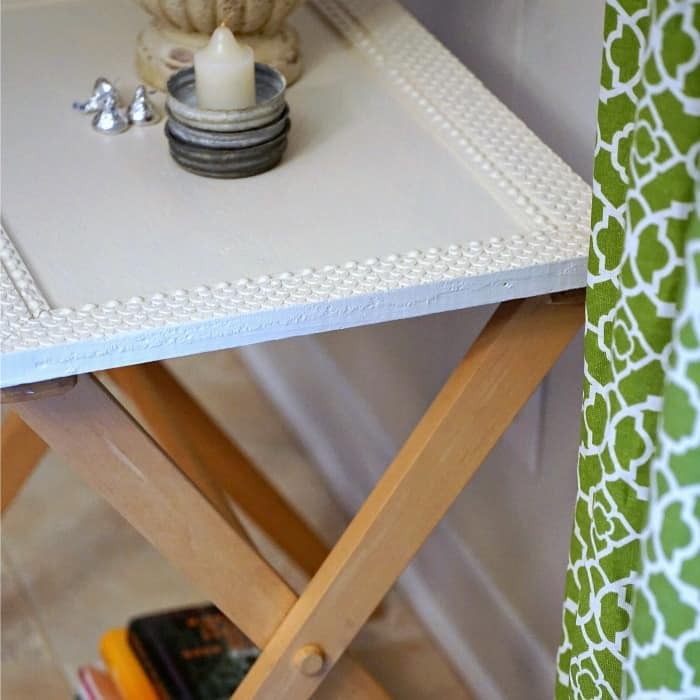 I’m not sure I’ve ever seen a luggage rack table like that in a thrift…but I like Kristin’s idea, too. 😉 Pinned! Great re-do! I like this idea very much! super job! 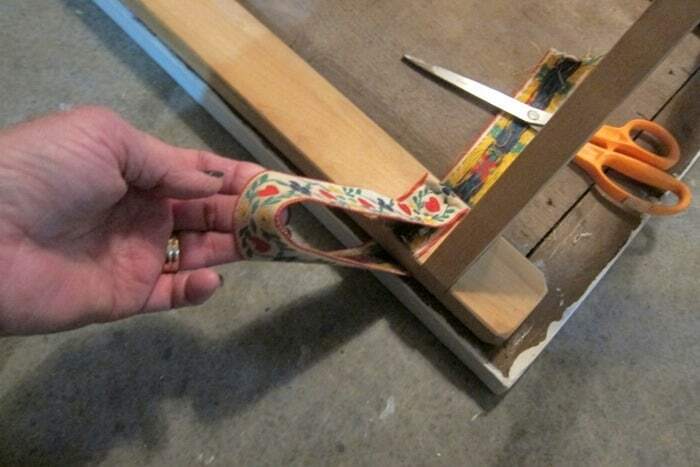 Smart to leave the straps until after the frame was attached. Great project. I find those tray tables every summer at garage sales. 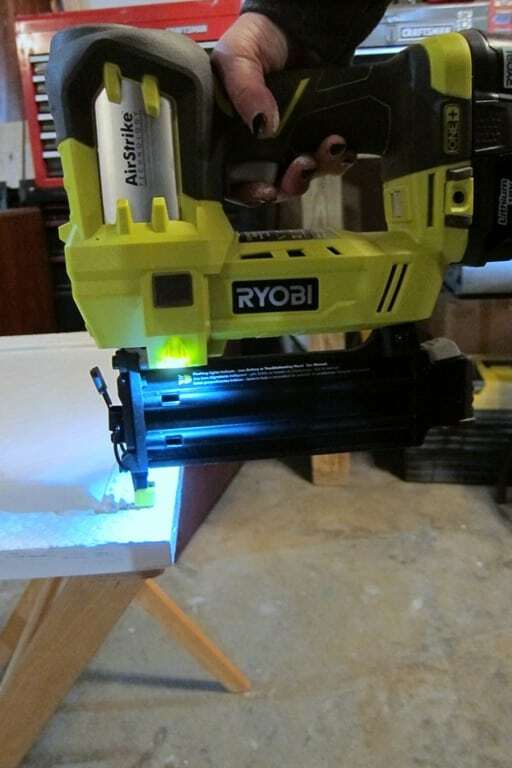 Could I get the specifics on that nailer in the picture please? Thank you.